A little more than a year ago, Kevin White entered the NFL with expectations as high as he is fast. He was the No. 7 overall pick by the Chicago Bears, and the West Virginia wide receiver was expected to be another dangerous weapon for quarterback Jay Cutler. But soon after he arrived in the Windy City, an injury popped up in his left shin—a stress fracture that would require surgery. Last August, White had a rod inserted into his tibia, sidelining him for his entire rookie season. 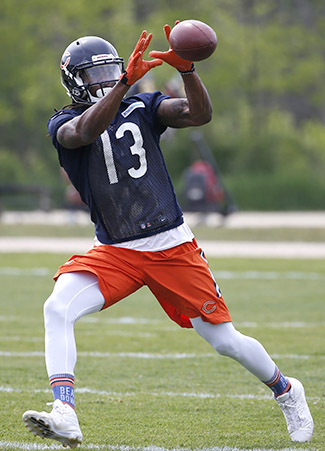 Now, he is back on the practice field, eager to prove to his teammates, Chicago sports fans and the Bears organization that he was worth the wait. VRENTAS: How does your left leg feel today? WHITE: It feels great. No problems; no issues; no restraints. I wouldn’t be able to tell you I was hurt last year if I didn’t know that. The leg isn’t giving me any problems, thank God. I’m trying to move forward, and make my future. VRENTAS: Did you have to learn how to trust the leg again? WHITE: Last year, yes. Doing certain exercises, and getting back to my running form, and running routes. That was all last year. That was one of the reasons why I wasn’t able to come back [at the end of] last season. The leg wasn’t ready. I wasn’t ready, mentally or physically. But all that stuff was last year. This year, being back out there is regular to me now. I feel no different. VRENTAS: How much progress have you made this spring? WHITE: It’s been great. Trying to get on the same page with Jay [Cutler]. It’s a work in progress, but it has been going well. It feels great to to be back with the guys, and getting better with them, and just be out there practicing. Usually I am in a training area doing a whole bunch of exercises, watching them have a good time out there. So being out there with them is fun. White says he has felt 100% healthy in mini-camp. ​VRENTAS: How connected were you able to stay with your teammates while injured? WHITE: I was there every day in meetings, and I traveled with the team [starting] midseason. So it was really easy for me to stay connected with the guys. It was as if I was playing, but I was just not out there on the practice field. Everyone was in my ear, wishing me the best and trying to get my hopes up so I could move forward a little bit more. VRENTAS: Did you use last year like a college redshirt season? WHITE: You could say that. It was a learning experience. The travel; having to wear a suit; seeing how things move differently compared to college, whether it is meeting times, preparing for the game, walkthrough. All of that I am pretty sure is going to help me out this year. It will be the same routine. VRENTAS: What was the hardest part of missing your rookie season? WHITE: Not being able to play with my teammates. Not being able to show what I can do. Having to get through the injury. There were a lot of things that were really hard last year. Last year was just a hard year for me. For the fans, and my teammates, it definitely wasn’t the year any of us was expecting. Looking forward, we are excited and we are hungry. VRENTAS: How did you find out last summer that you needed surgery? WHITE: It was during camp last year. Just a few hours before everyone else knew. [GM] Ryan [Pace] just grabbed me, and gave me that look, and said, “Kevin, you know what is the best bet for you and our future.” And I just burst into tears. Didn’t have to say too much, because in the back of my mind I knew what I had to do anyway, but I kind of needed Ryan and [Coach John] Fox to verify that. Just to let me know it was OK to do that. I didn’t want anyone to look at me strange or differently now that I wasn’t going to be able to compete all season. Once the head guy told me that’s what they would like me to do, that’s what we went with. But it was heartbreaking. I felt like I wanted to throw up. I’d wake up with nightmares, tossing and turning. I was crying, upset, all of the above. Words really can’t explain it. VRENTAS: How did you push through that? WHITE: Family, friends, teammates, coaching staff. Fox. Ryan Pace. Coach Dowell [Loggains]. Cutler stayed in my ear. Eddie Royal. Agent Eugene Parker. Mom, dad, brothers, sisters. Everyone was very supportive and trying to help me fight through this nightmare. Having them by my side, and just my mentality of wanting to get back to my old self, I push myself every day as hard as I can. That’s how I went about it. • REMEMBERING EUGENE PARKER: The late agent was trusted unconditionally by his players and respected. Andrew Brandt writes that in a cutthroat business, he’ll never forget how Parker treated him as a friend. VRENTAS: Instead of a short-term setback, do you see surgery as a long-term gain? WHITE: Yes, definitely. It is a marathon, not a sprint. We did what was in the best interest for my future, as well as the Chicago Bears and the fans. You never know what would have happened if I didn’t get the surgery and I went out there. That was the best bet for us, so I’m glad we went with it. Moving forward, we are excited. There are no restraints on my leg, everything feels normal, and I just can’t wait. VRENTAS: How tough was the rehab for your injury? WHITE: Very tough. Any injury is tough, especially when you have surgery. Your leg and your body aren’t functioning as well as they once did. You lose a lot of strength and muscle and balance. It is frustrating. You kind of wonder when you are going to get the strength and the power and the mobility back like it once was. You’ve just gotta stay patient. VRENTAS: Pace and Fox mentioned last summer that overtraining for the combine and pre-draft process may have contributed to the stress fracture. Have you adjusted your training approach at all? WHITE: Working smart, not dumb. I’m still working hard, but the team is looking after me. [Head strength and conditioning coach Jason George] is doing a great job, and making sure I am doing everything right and not overdoing anything. It is an adjustment, but I can get used to it. VRENTAS: You mentioned Cutler “stayed in your ear” during your rehab. How did he help you? WHITE: He told me to take my time and make sure my body is legit. He sent me to masseuses and chiropractors, and helped me eat the right foods and vitamins, and being able to stretch a lot. Teaching me a lot I didn’t even know about the body. He’d say, “Kev, you are not ready yet,” or, “You look good today, how is the leg feeling?” Things of that nature. He was with me every step of the way. VRENTAS: What was his best piece of advice to you? WHITE: Stay on top of your body as far as going to masseuses and chiropractors. VRENTAS: That was probably something you hadn’t thought of? VRENTAS: How are you and Cutler building your relationship on the field? WHITE: Repetition. Communicating a lot. Talking on and off the field about what we have to do, and what he would like me to do. • TALKING FOOTBALL WITH REX AND ROB RYAN: The chatter is fast, furious and full of bad words as the Ryan twins discuss their 2015 failures, their sideline reunion and how the Bills will beat the big, bad Belichick once and for all. VRENTAS: As a college player, you had to show patience. You sat out two seasons at Lackawanna College before playing there and catching the eye of West Virginia. Did that experience help you as an NFL rookie? WHITE: A little bit, but this was a lot different. I wouldn’t put that on the same level. This was my first-time experience dealing with a severe injury like this. VRENTAS: Was it different because of the expectation for a first-round NFL draft pick? WHITE: I try not to pay attention to that. I have very high expectations for myself, and I don’t think any expectations can be higher than mine. In the game of football, there’s pressure. Whether you are a first-rounder, or practice squad, or a special-teams player. For a walk-on player there’s pressure from family members, high school teammates and coaches to make the team. If you want to go from special teams to playing offense or defense, that’s pressure. So everyone has pressure any way you look at it. VRENTAS: What’s the pressure like for a first-rounder? WHITE: Proving that you are different. Proving that you were worth the pick. You want to make the organization and the guys upstairs look good, like they made a smart decision. Of course you don’t want to let anyone down, whether it’s fans, coaches, teammates, family, yourself. But I don’t get tied into all of that, to be honest. Play hard, play smart, and get better every day. • TALKING FOOTBALL WITH BROCK OSWEILER: The Texans’ new quarterback opens up on his leap of faith and what to expect in Houston. VRENTAS: When you were sidelined last season physically, how did you work on the mental side of the game? WHITE: Studying defenses. Studying receivers. Trying to learn the ins and outs of the game. VRENTAS: Which receivers did you study? WHITE: I watch our receivers, Alshon [Jeffery] and Eddie [Royal], seeing how they move guys different ways. I will watch Julio [Jones], Larry [Fitzgerald], and a lot of other receivers. I am a big fan of Larry, and we are pretty cool friends. And I am pretty cool friends with Demaryius Thomas, so I watch him. I tried to just soak up as much knowledge as I could. VRENTAS: One of the questions when you came out of college was that you hadn’t been exposed to the entire route tree. How have you worked on that in the past year? WHITE: There are definitely a lot more routes here at the professional level. But I think routes are routes. They tell you to run a post-corner, you take seven steps forward, take three to the post and go back out. But how you set a defender up in different ways, that may be new. You get better with repetition. VRENTAS: Since you were hurt last year, and Alshon Jeffery hasn’t been at the voluntary offseason practices, you haven’t gotten to be on the field much together. How do you hope the two of you can play off each other when you do? WHITE: When Alshon gets back, I am sure it will be good. Just have to be patient and do what I can. Whatever he is doing, I am sure it will help team in whatever way. But when he gets back, we will see. VRENTAS: You mentioned your agent, Eugene Parker. Earlier this spring, he passed away after a battle with kidney cancer. What will you remember about him? WHITE: He was definitely the best agent in the game. He was a legend. He was very smart. He was very humble. Taught me a lot of life lessons. He thought so much of me and had so much confidence for me. He definitely was a close family friend and not just an agent. Wish he was here, so I don’t have to go through this process again, but me and his family are still pretty close. VRENTAS: The NFL hasn’t seen you yet. What kind of receiver do you want to be? WHITE: Whether it is jump balls, route-running, being a deep threat or intermediate routes, I just want to be the best player I can be. I want to maximize that. Wherever the coaches put me, I will do my best to make myself and them look good. VRENTAS: You have had plenty of time to envision your first NFL game. How do you picture it going? WHITE: It is still a dream for me, because I didn’t play a game yet. But I know I will have a lot of emotion, and maybe some nerves. I’m not going to go out there and say what people should expect from me. But hopefully, they’ll like it.